Do You Prefer the Fuel Efficiency of a Direct-Fired Heater or the Safety of an Indirect-Fired Heater? What If You Could Have Both? You’re probably familiar with direct-fired and indirect-fired heaters. Depending on the environment and application, you’ll choose one or the other for your next construction project. But, did you know that there are different types of direct-fired heaters? It’s true. One type of direct-fired heater gives you the fuel efficiency of a direct-fired heater and the safety of an indirect-fired heater. Before we do a deep dive, let’s do a quick refresher. When you think of a direct-fired temporary heater, the first thing that probably comes to mind is a portable, barrel-shaped unit. Often referred to as a torpedo or salamander heater, these are open-flame, direct-fired heaters and offer greater fuel-efficiency than their indirect-fired friends. As the name suggests, a direct-fired heater forces air directly through its burner to generate heat. 100% of the fuel consumed is converted to heat. Because of its open-flame design and blower design, these heaters usually can’t be used with ductwork. So, they’re placed inside a building or enclosure. Think of them as space heaters on steroids. To minimize the buildup of dangerous carbon monoxide and moisture, these units must be placed in well-ventilated spaces. Though construction sites are usually ventilated, there’s a big difference between passive ventilation and proactive, well-designed airflow. Ventilation simply means outside air can get in to an enclosure. Air seeping in through tarp openings, temporary doors and other gaps does little to circulate fresh air and distribute heat. Clean. That’s the perception you probably have of indirect-fired heaters. Combustion is contained in a burn chamber. The exhaust is vented through a stack on the heater and is isolated from the heated air that is delivered to the building. Indirect-fired units can be placed inside a structure. The exhaust will be directed outside through ductwork. But, this produces negative pressurization (pulling air from openings in the structure) as it heats inside air. Usually indirect-fired units are placed outside a structure, so they can draw on fresh, outside air. Instead of re-heating the air inside a structure, indirect-fired heaters in this configuration draw outside air through intake vents. The air is passed over the burn chamber and heated. Blowers force the hot air into a building through ductwork. Safety concerns about carbon monoxide and moisture are greatly reduced—the reason these units are considered clean. But, there’s a price you pay for clean: Fuel efficiency, which drops to 75% for these heaters. You have to burn more fuel to get the same result. Concealed-Flame, Direct-Fired Heaters Give You the Best of Both Worlds! One type of direct-fired temporary heater provides both fuel efficiency and safety. Concealed-flame, direct-fired units are unique. Since the flame on these units is concealed (not an open flame) and the blowers have enough horsepower to force air into a building, they can be used with ductwork. So, you get the benefit of placing the unit outside and accessing clean, fresh air. Because of their direct-fired roots, these temporary heaters also provide excellent fuel efficiency. Outside air is drawn into the heater, blended with combusted air before ductwork delivers clean, dry heat to the building. Blowing hot air into a structure also has the added benefit of providing positive pressurization, which leverages simple physics to ensure a proper air change and distribute heat effectively. Open-flame direct-fired heaters, in contrast, actually create negative pressurization and pull outside air into an enclosure through openings. Concealed-flame direct-fired temporary heaters combine the fuel efficiency of direct-fired heaters with the safety of indirect-fired heaters. 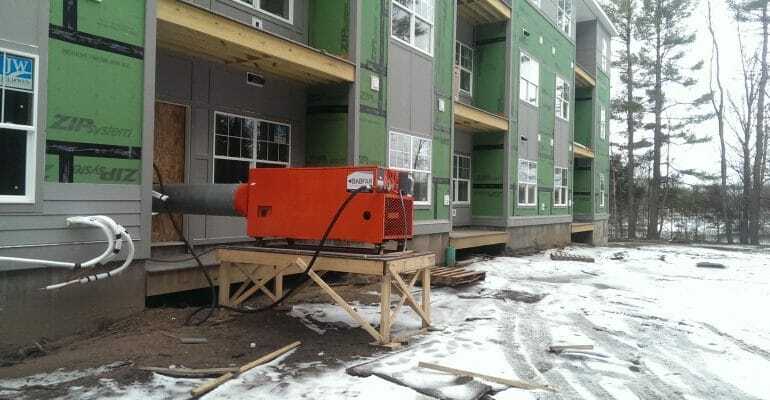 It’s the one temporary heating unit that can be used in any environment on any project.